Translating as "City of the Horse Carriage," Lampang still remains relatively untouristed, which gives it an authentic, traditional feel that's hard to find in a lot of other Thai tourist hotspots. Old-fashioned horse-drawn carriages, a lack of modern high-rises, and tranquil, relaxing rivers and valleys add special charm to a Lampang holiday. 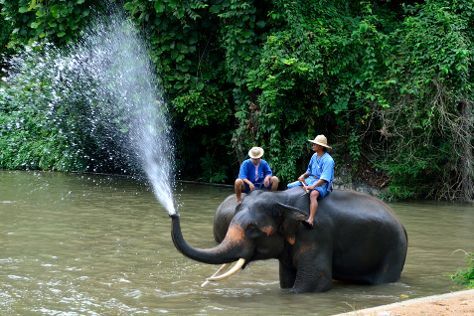 Elephants roam here in semi-wild conservation habitats, while must-see cultural attractions in Lampang include the city's nearly 1,000-year-old Lanna-era wooden temples. Lampang is in Lampang Province. With our online itinerary creator, Thailand vacations can be built around trips to Lampang and other destinations in Thailand. Budget-friendly accommodations in Lampang abound, including hotels, bed and breakfasts, and guesthouses. A lot of these represent good value and offer basic, clean rooms in conveniently central locations, perfect as jumping-off points for your travels. Do temper your expectations a bit, as many of these hotels are family-run and may not have English-speaking managers. Phone ahead, since some hotels may be fully booked due to popularity.